We learn how a human being must function in harmony with reality and not be destroyed by it through our ignorance, laziness and corruption. In the traditions, we say that if nobody corrupted themselves, nobody would get hurt. We say nobody dies of wisdom, only ignorance. 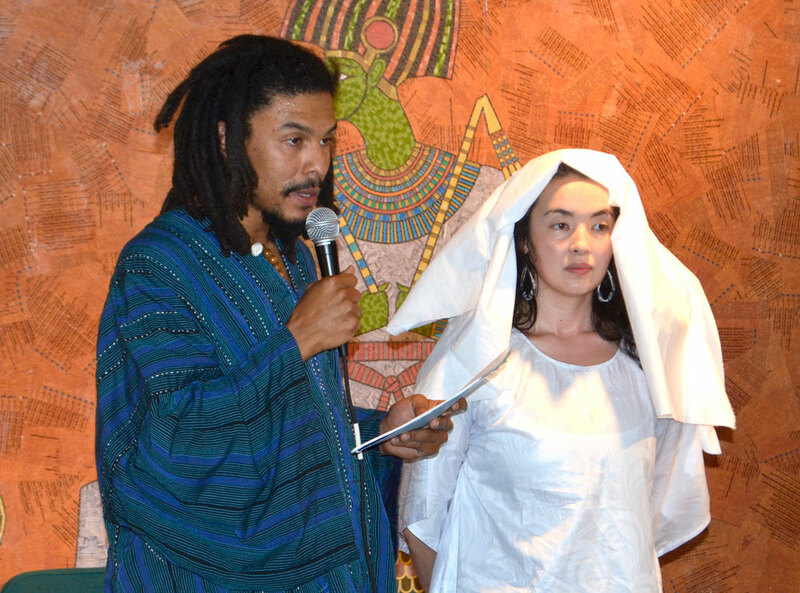 In the M’TAM School of Kemetic Philosophy and Spirituality, our focus is on our survival as expressions of the Earth and as spirits who live on after our bodies die. The logic of survival is simple, that which fits in harmony with existence survives, that which does not is doomed. The problem humanity faces is that existence is always changing. It takes effort to evolve and fit in well enough to survive. If we are given a choice between doing what is difficult and what is easy, we tend to choose what is easy. We will make the choice that does not require us to suffer. We will do what we are comfortable doing. Now that we have been convinced that we can give a minimal effort and still survive and even achieve the greatness we seek, we have seen the decline in our capabilities, the quality of our work and the quality of our lives. We are seeing everything that we have been working for falling apart. At The Earth Center, we have committed ourselves to doing something about it. There is nothing easy about reclaiming our minds and freeing ourselves from the mental laziness that has been ingrained in us. We know of so many people who would rather kill themselves by smoking, drinking or overeating simply because they lack the mental discipline to change their behavior, even for their own survival. 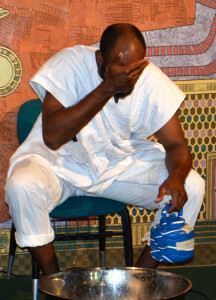 This is how vulnerable a human being is to corruption. Human corruptibility requires that initiation be difficult. It requires that we put all of our effort into building our minds and our qualities. This is the only way to become a survivor. Any good quality we have achieved has come as a result of our effort to attain it. We know that in a moment of stress, it’s easier to let our emotions take over than it is to calm ourselves down and act intelligently. However, acting emotionally will lead us into rash and foolish decisions. These decisions often result in loss, conflict or even death. Initiation forces us to face difficulty so that we can learn to make intelligent decisions in difficult situations. Many will argue that our traditions should be easy or free to access. Many resist facing the challenges that initiation brings and make excuses for why these challenges are unfair or insurmountable. In reality, one only seeks to legitimize failure. Survival is the result of hard work but we even need to be educated to know how to direct our efforts. Our modern lifestyle has succeeded in convincing us that survival should not be difficult and we should instead put our efforts towards our careers and entertainment. Ironically, this disconnection from the rules of survival has led us to become parasites on each other and on the Earth. We think we have secured our survival in a misguided war against nature but which kind of survival tactic destroys the source of one’s own life? Without initiation to educate us to be survivors, we see the situation humanity is now in as we continue to be the biggest threat to ourselves, each other and the world. It is time to return to our origins. The initiation provided by The Earth Center’s M’TAM school educates initiates in the principles of survival. Initiates learn that they are on an individual journey, but not only responsible for themselves. Therefore, survival is not seen as an individual effort. Survival of the individual is linked to the society and its values, the bloodline and family structure and, of course, nature and the Earth itself. After learning these principles, regardless of whether or not the graduates continue on the path of initiation, each of us is responsible for acting on what we now know. We are welcoming the Debasah generation. 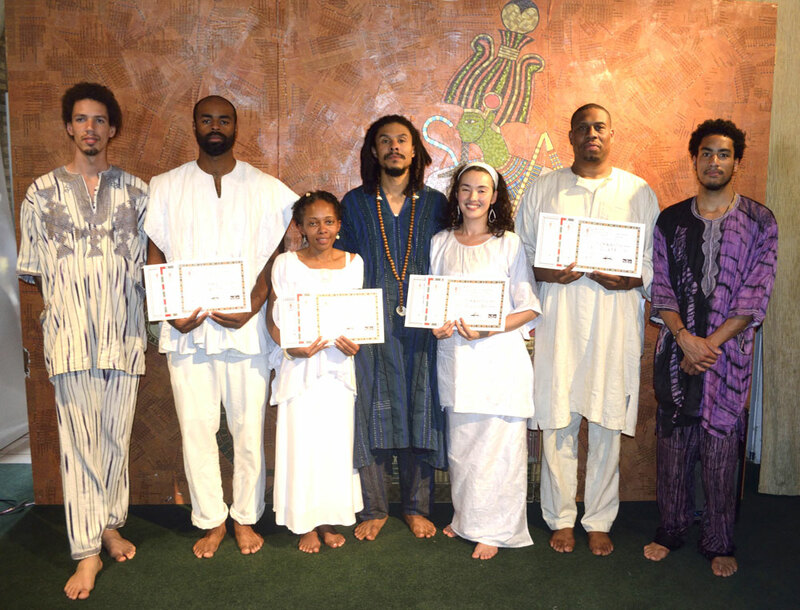 These graduates join the legacy of M’TAM initiates who are leading this cultural revolution to return traditional values and culture to humanity. Graduation represents the entry into a new phase of the initiation. It is similar to rebirth. For those with the courage, intelligence and dignity to continue, the real work is just beginning. Having gained a clearer perception of the true face of existence, they must now face the world with no excuses and no expectations. They must make every adjustment necessary to step correctly along this path. The graduates have the added responsibility of guiding generations of initiates to come in the M’TAM initiation and begin teaching them what they have learned. The lessons they understood well enough to graduate, they must master in order to teach successfully. Their lives must be a reflection of what they are teaching. Bouziri (Formerly Kwame Jordan) – Place of the God Wsr (Uziri or Osiris). Giziribtah (Formerly Belinda Woods) – Pure heart belonging to the Earth. 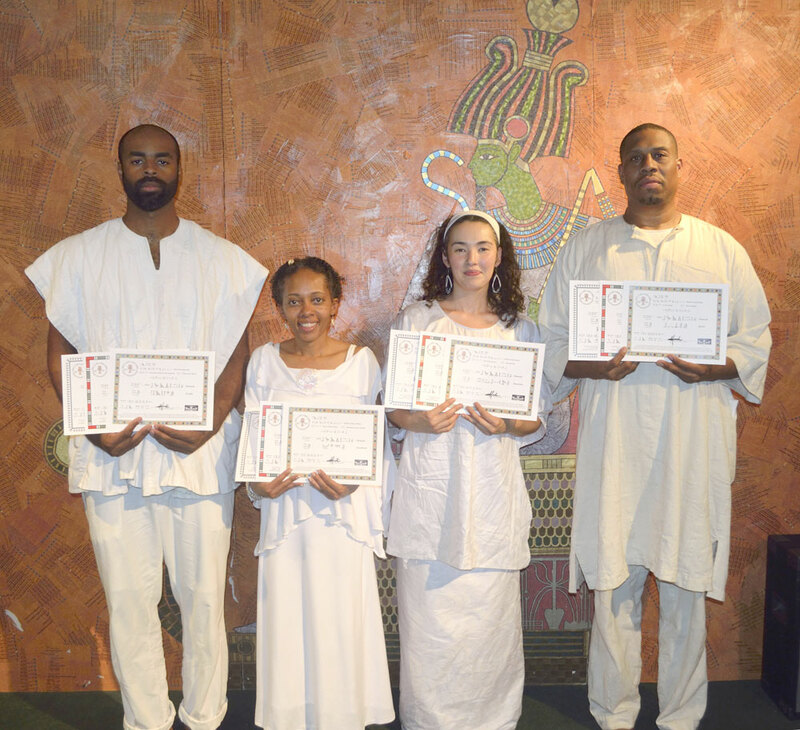 They have graduated from all 3 classes offered by the M’TAM initiation: Medu Myeet (hieroglyphs), Ka’at Ibi (meditation), and Sounnt (healing). These classes lay the foundation for how a Kem understands the world and how one can survive within it. To truly grasp what has been taught, the initiate must face challenges which force him/her to let go of old habits and conditioning and adopt a different way of perceiving and approaching the world. These principles must be applied in order for one to graduate, but crossing the threshold of graduation does not reduce the risk of reverting to destructive and self-destructive behaviors. The knowledge we acquire in initiation and the names we receive at graduation represent a challenge we each must rise to without the guarantee of success. We must recognize that we are either builders or destroyers. We cannot stand to the side as human corruption spirals further out of control and claim that we are not part of the problem. There are no innocent bystanders. Everyone will have to choose. The root of our problems is not a mystery. After 2500 years of destroying the world and each other, it’s time for humanity to abandon the philosophy of fun, comfort and pleasure and embrace the challenge of living in harmony with the Earth for the sake of our survival and the survival of generations to come.